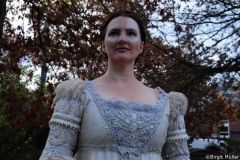 The costume design of the whole film is geared to the fashion of the early Renaissance era. The gown is double-layered. The underskirt is made of off-white crepe satin. The hem of the skirt is padded. 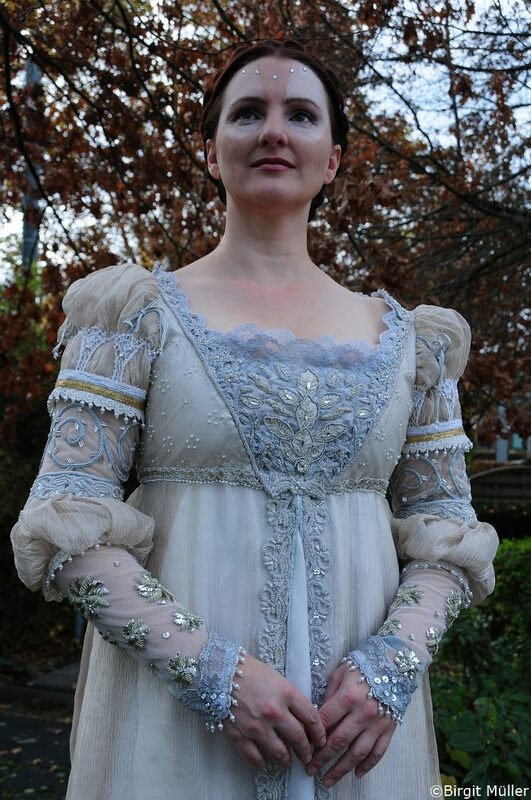 In contrast to the screen used gown, the overskirt is exclusively made of brass-colored metallic crinkle and not of panels from embroidered and unembroidered metallic crinkle. The overskirt has a small train. The front opening is decorated with a silver bullion trim. 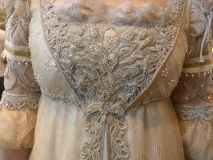 The bodice has a overlay of flat ironed brass-colored metallic crinkle and is beaded with clusters of pearls and seed beads. 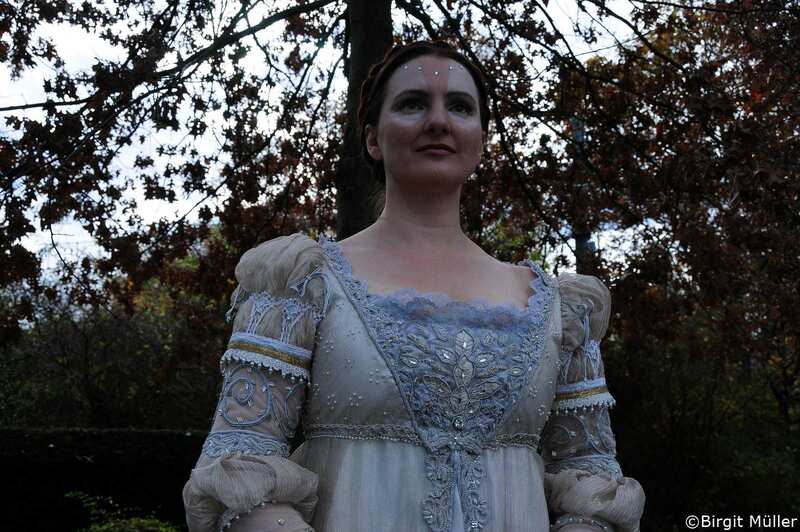 The front insert of the bodice is V-shaped and backed with lace in gold and silver. 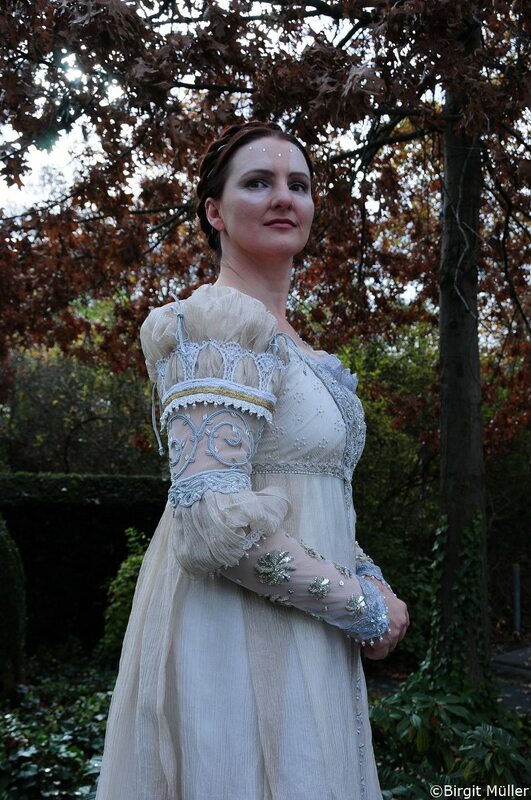 It’s heavily decorated with bullion trims, bullion appliques, bullion thread, seed beads and rhinestones. Eleven light fawn leaves are embroidered at the center of the front insert. Each leaf is framed with bullion thread, beaded with some clear seed beads with a silver core and a clear rhinestone in a socket is placed in the center of each leaf. 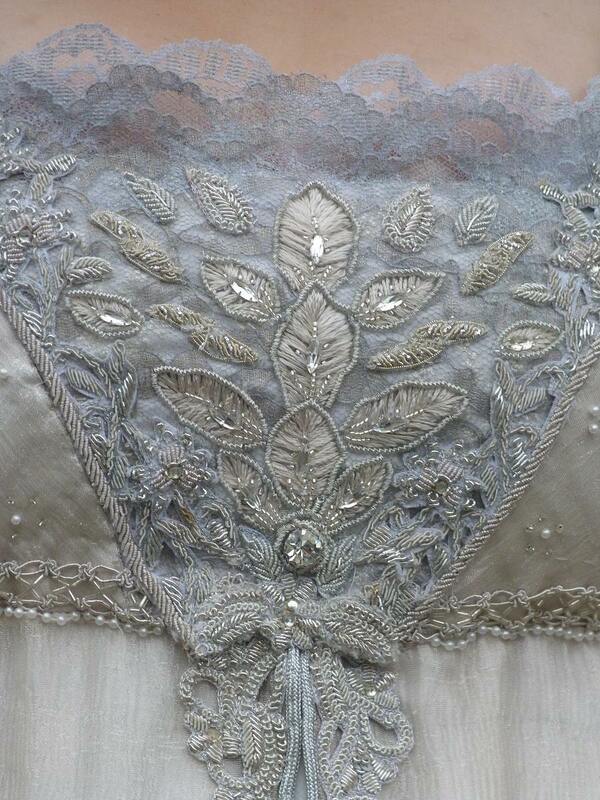 Other leaf-like, bullion appliques are placed between the embroidered leaves. The neckline is decorated with a silver lace and a silver bullion applique trim. 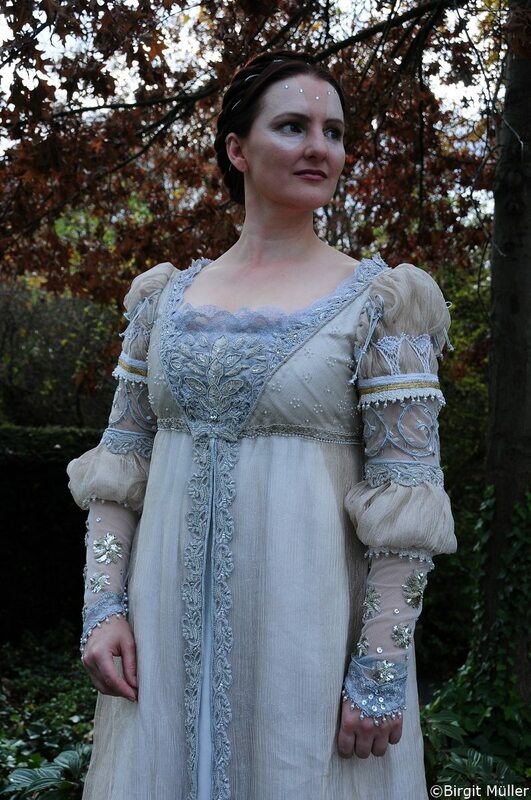 The waist seam is hidden bay a pearl trim and a silver metallic trim. Finally, I managed to remake the sleeves in 2015. The sleeves consist of different segments. The wide, puffed segments are made of brass-colored metallic crinkle and mounted an a tight-fitting inner sleeve made of golden duchesse satin. 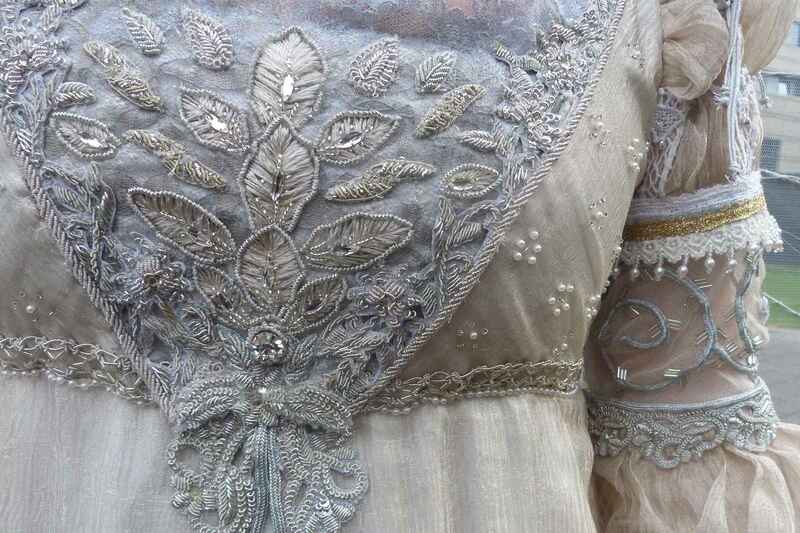 The puffed upper sleeve is tied with the help of 3 pairs of silver soutache. 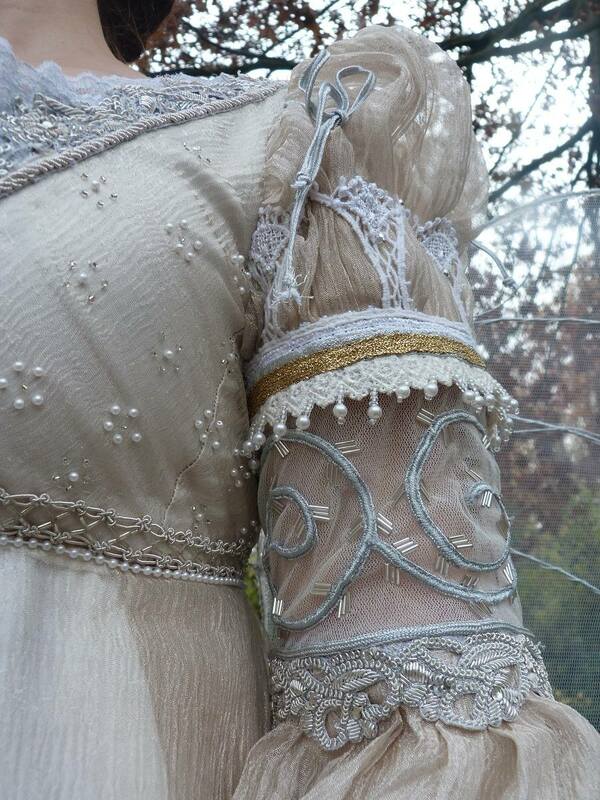 A silver ribbon, a gold ribbon, a pearl fringe and three ivory crocheted trims (embroidered with facet cut metal beads and tiny, clear bugle beads) are placed just above the upper gauntlet. 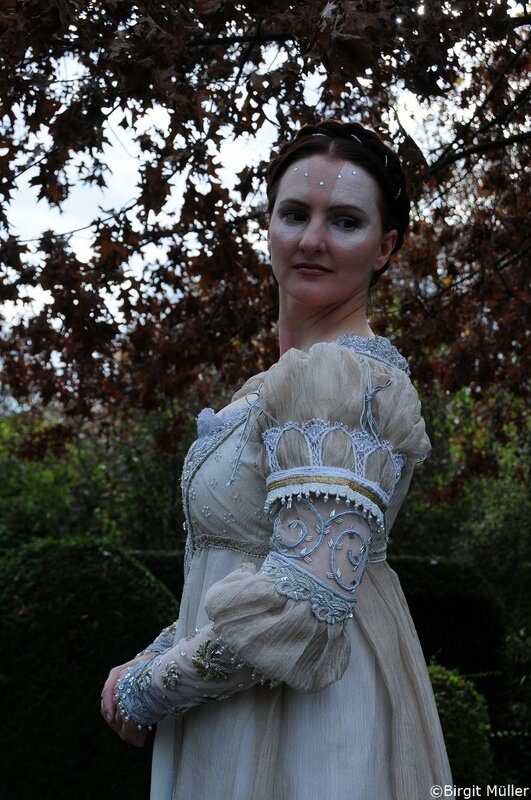 The gauntlets are made of a doulbe layer of ivory colored tulle. 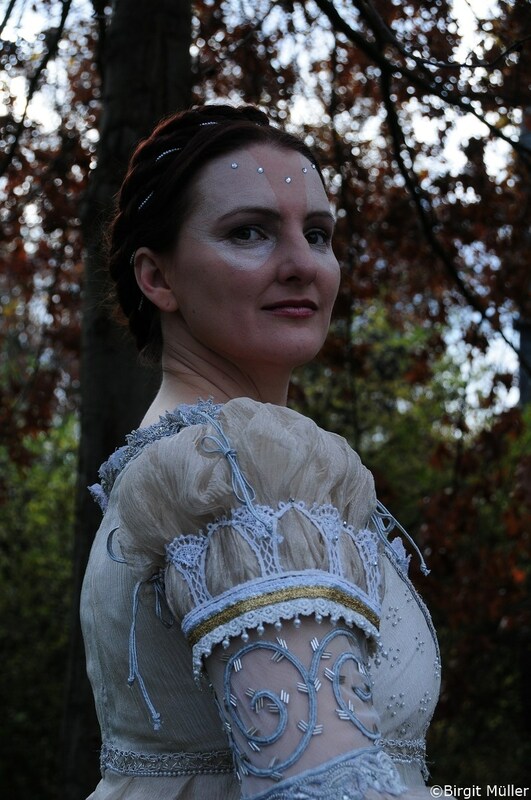 The upper gauntlets are decorated with a narrow silver passement trim in a swirl-like design and clear, silver-lined bugle beads. 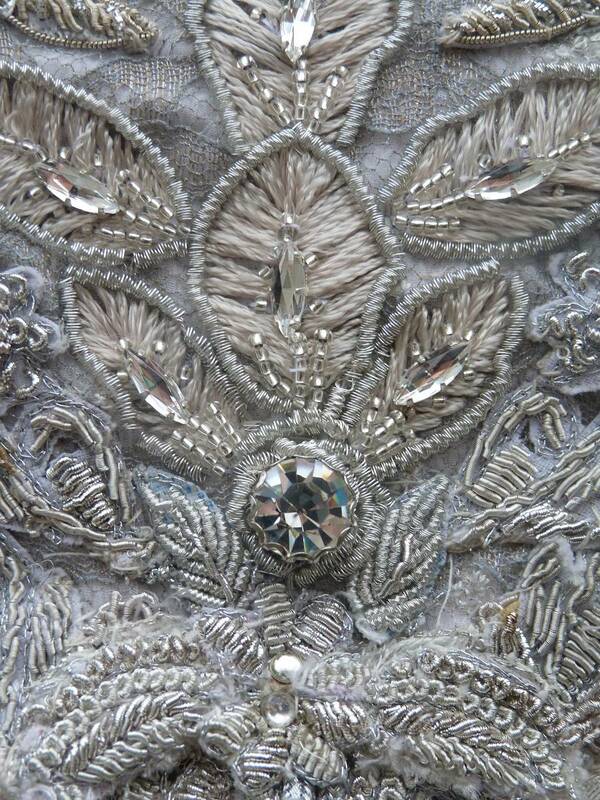 A silver bullion trim is sewn onto the lower edge of the upper gauntlet. 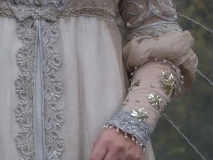 The lower gauntlets are decorated with silber flower appliques, silver sequins, clear, silver-lined beads, a silver lace trim and a pearl fringe. 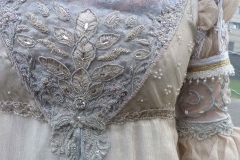 The upper edge of the lower gauntlet is decorated with the same silver metallic trim as the waistline and a pearl fringe. 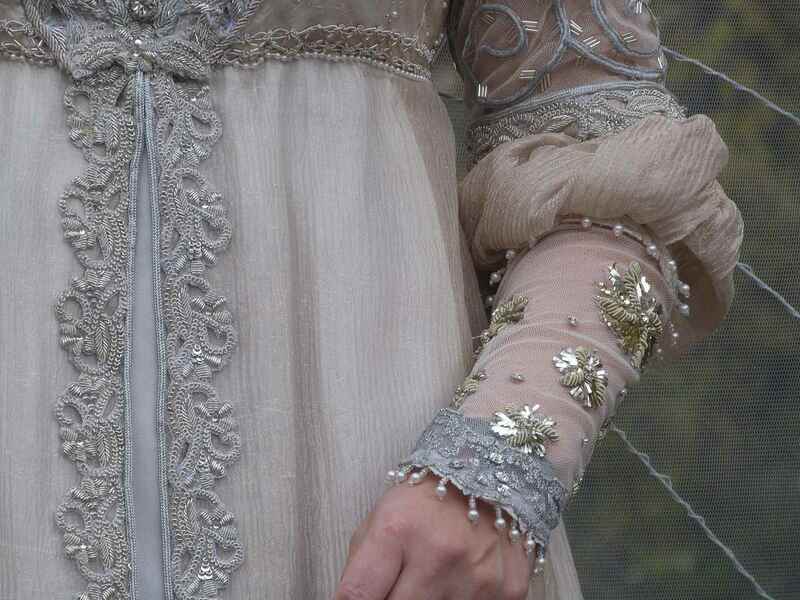 The sleeve hem is edged with silver lace and pearl fringe. 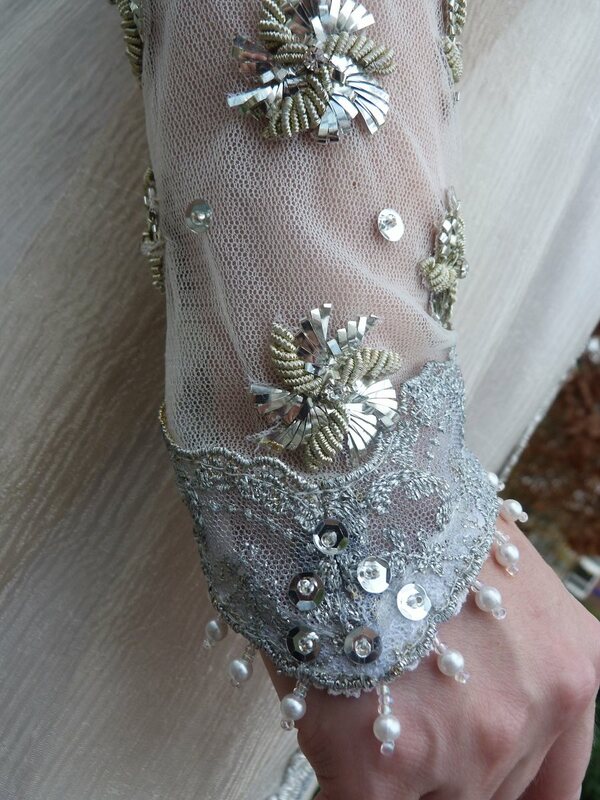 Silver soutachee and big pearls fake the sleeve slit and button closure. 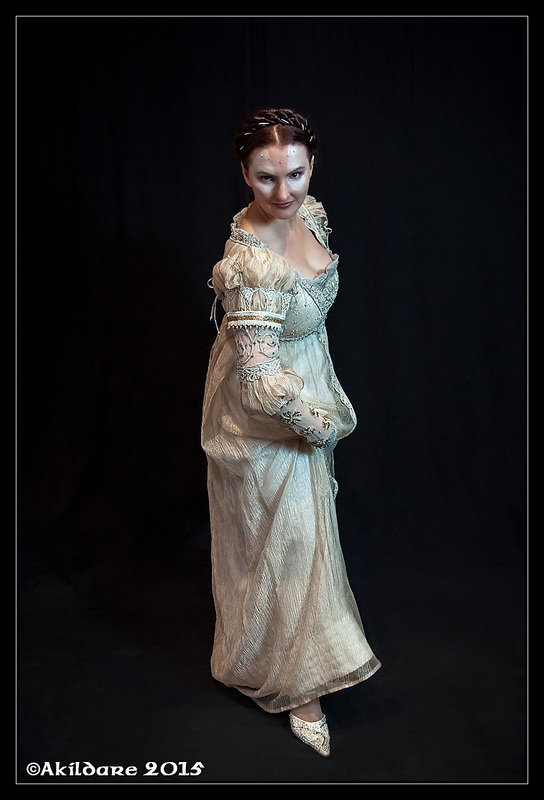 The gown is completely lined with white acetate linning and closes in the back with an invisible zipper. 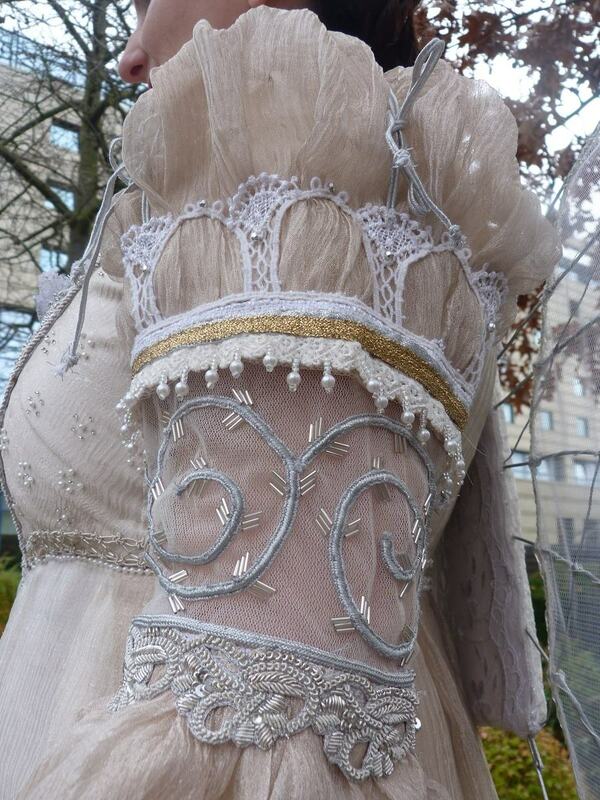 The wings are made of steel wire, wire mesh, white tulle and some remnant fabric and appliques for covering the holder. 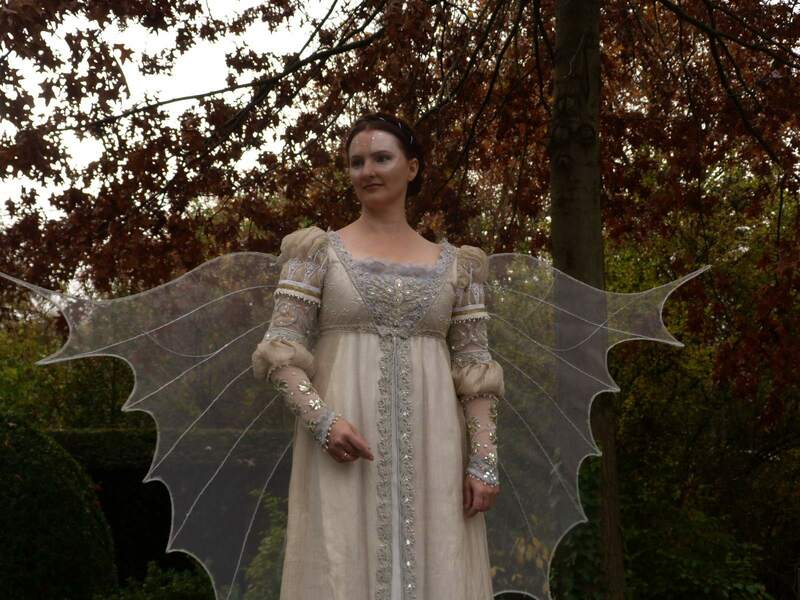 The wings are shaped with the help of a 1:1 scaled sketch of the wings. 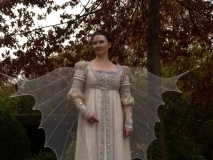 The crossing points of the frame of the wings are swathed with thin wire and brazed. 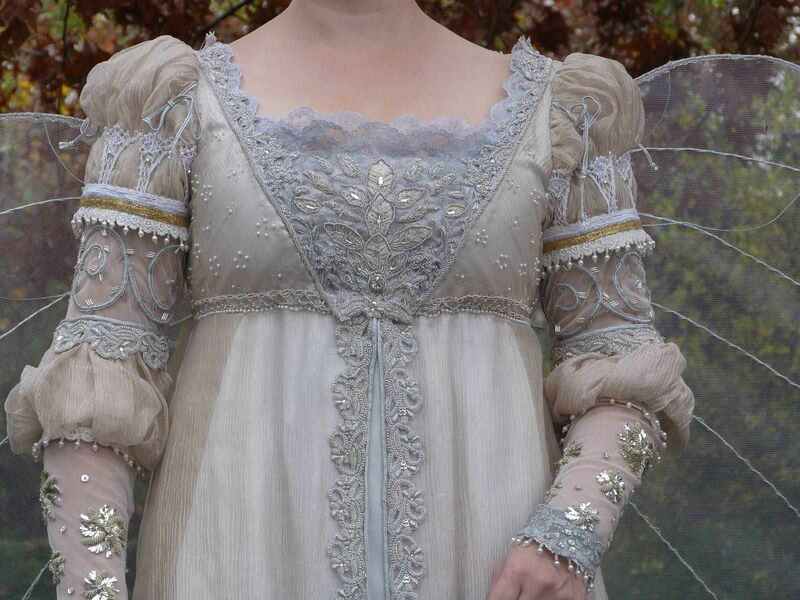 White tulle is sewn onto the wire frame of the wings and the edges of the wings are painted with golden acrylic paint. 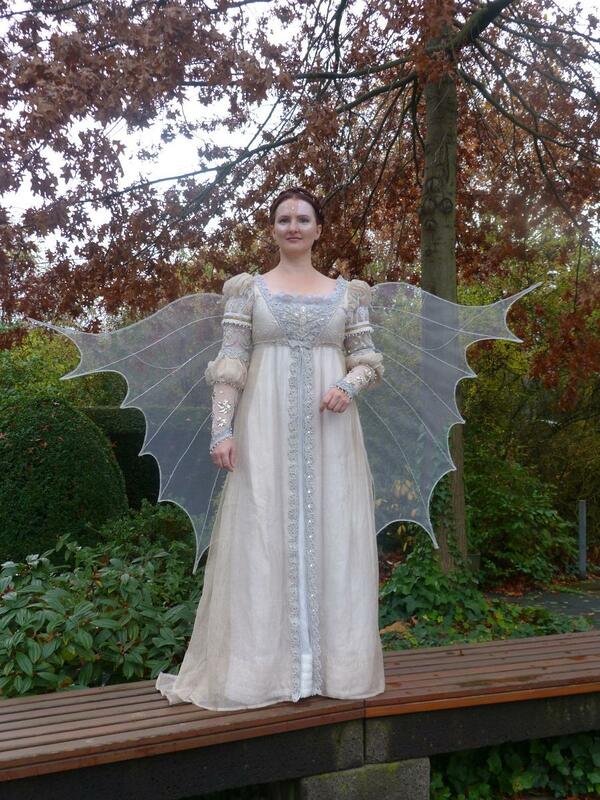 In contrast to the original gown, the wings are not directly attached to the gown itselft (resp. 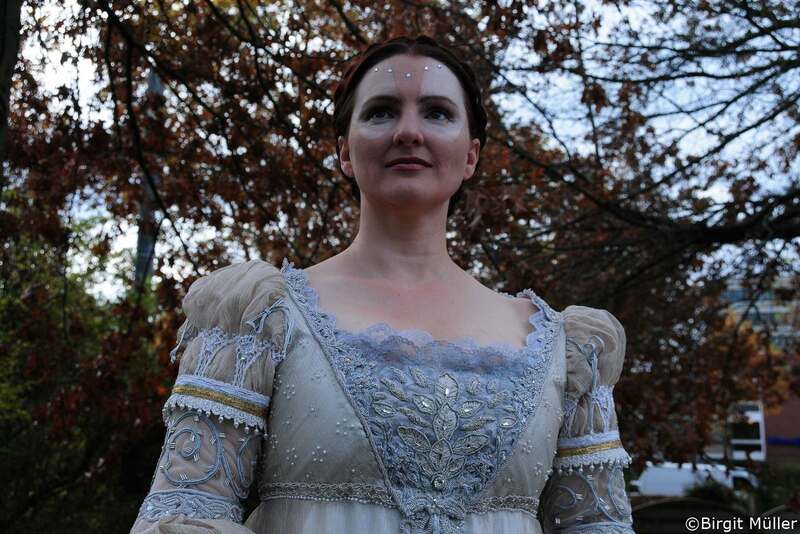 a corset which Drew Barrymore wore underneath). The wings are constructed as a separate piece. Therefore, the wings are mounted on a rectangular piece of wire mesh which serves as base of a backpack-like holder. 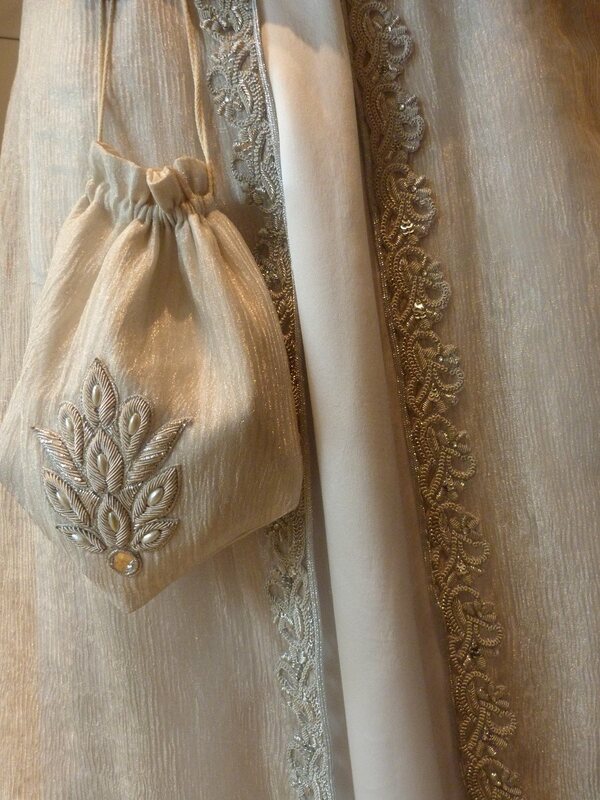 The backpack-like holder is covered with white felt, white welvet and silver embroidered white tulle.Two straps of a cream-colored ribbon are running from the holder over the shoulders and breast to a belt worn underneath the gown. A slip-knot at the bottom of the holder is connecting the gown with the wings and avoids the wings from swinging. 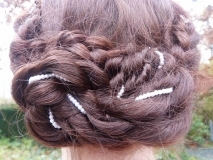 Three rows of twist-braided artificial hair (two with an additional strand of pearls woven in) are mounted on a rigid alice band. 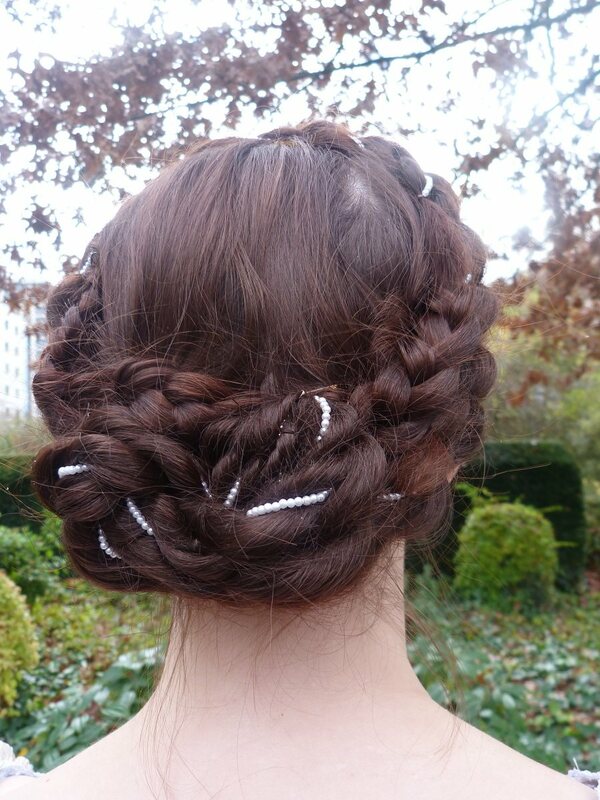 The bun in the neck is made from my own hair. 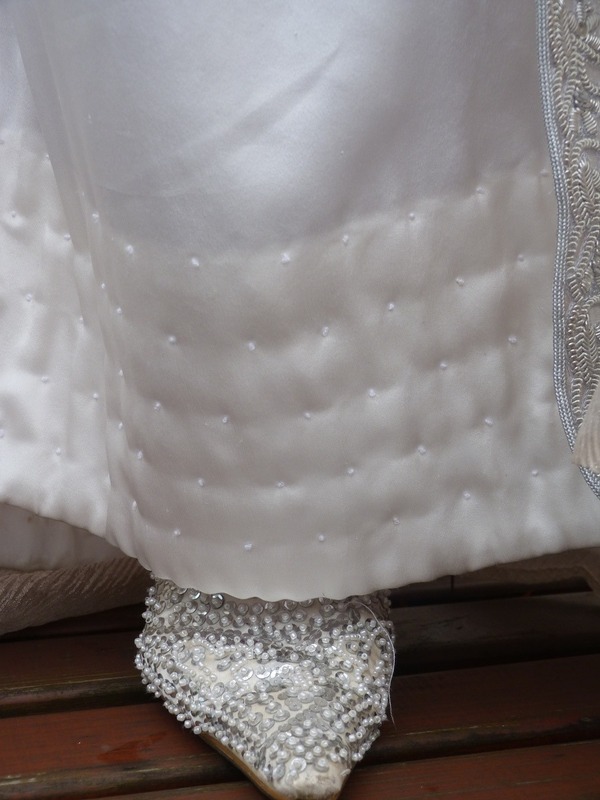 I wear silver beaded ivory sling pumps with the gown. 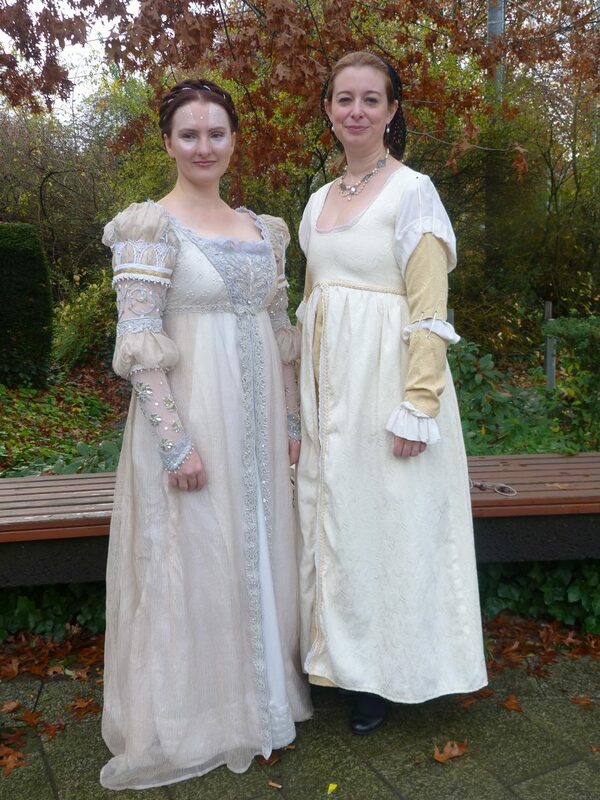 I bought the gown from a very nice person. 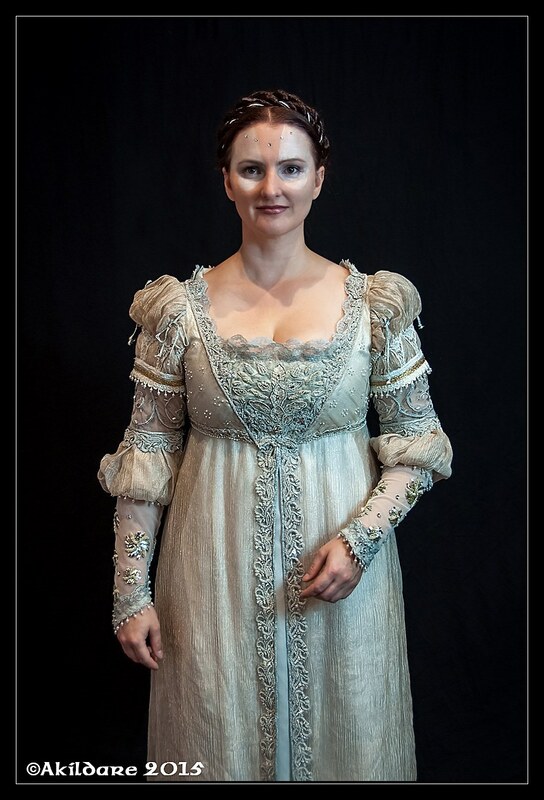 And although the gown was breathtaking by then, I started to work on it in order to come even more close to the screen used gown. 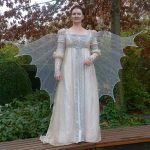 I replaced the existing bullion trim with a better one and added a lot of beads, rhinestones, sequins and appliques… and the wings! Andreas Kinder, Chrissy and Birgit Müller, thank you for the pictures!